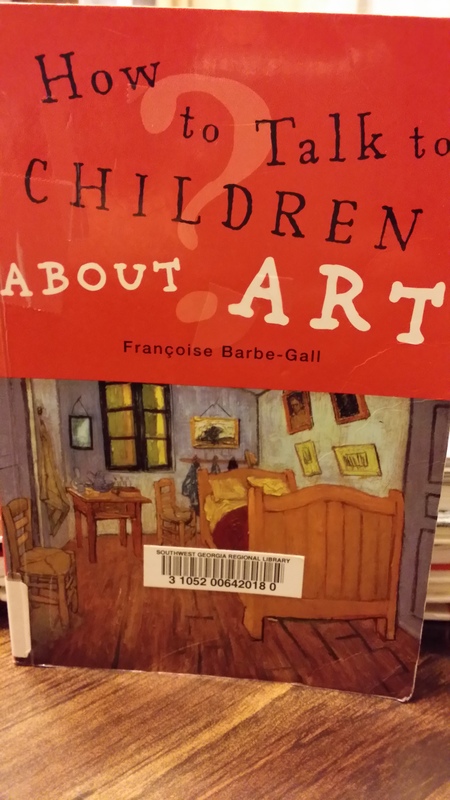 Check https://schoolinginpajamas.wordpress.com/2014/12/03/how-to-talk-to-children-about-art/ and https://schoolinginpajamas.wordpress.com/2014/12/20/how-to-talk-to-children-about-art-part-2/ for the posts on my reviews of section 1 and section 2 of the book. Section three is titled ” How to look at a picture”. 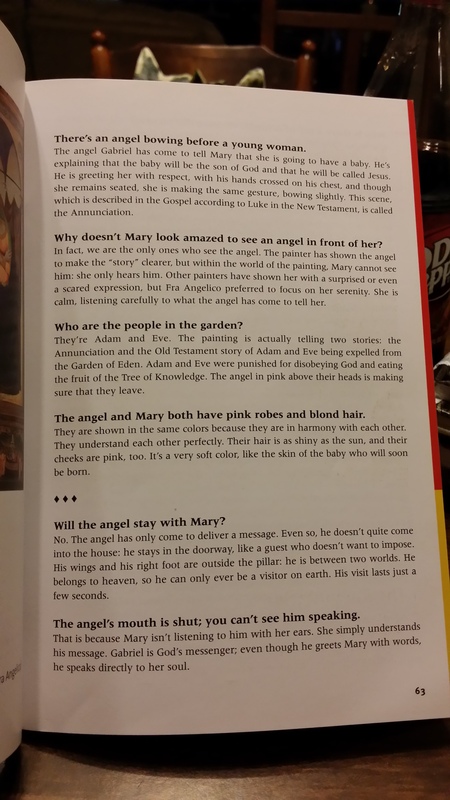 In this section, the author uses three colors to break things down into age groups. Red is used for five to seven year olds. Yellow is used for the age group eight to ten year olds. The color blue is used for eleven to thirteen year olds and older. The author says her aim for these pages is to “help you help your children look at pictures”. There are thirty pictures. The attempt of the author is not to attempt to include all the best known paintings. The pictures are explained step by step and the information/questions is roughly addressed for the “child’s curiosity” according to their ages. That is the reason for the color codes. You can see in this picture the colors are used on the edge of the pages. 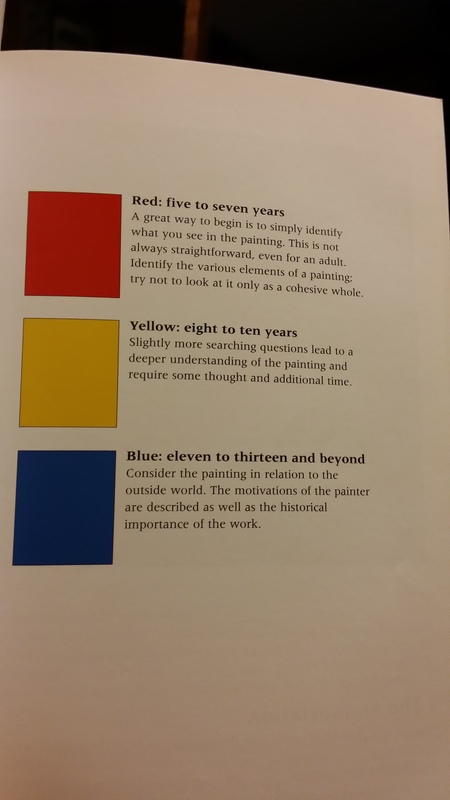 This page has red and some yellow then followed on the next page with the rest of yellow and the blue. 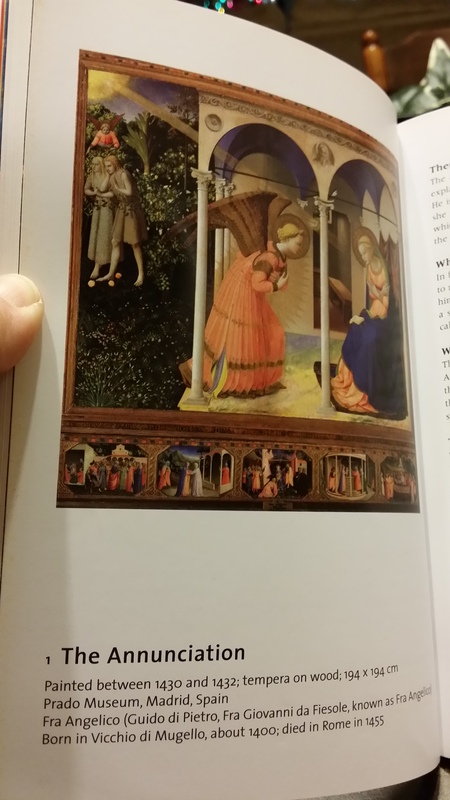 The first picture offered is “The Annunciation” by Fra Angelico. You get a small to medium picture followed by title, date painted, painting info such as what painted on and how big, the painter, and the painters basic info such as where born, date of birth and date of death. Here is the first page. The author does not offer questions per se but information we may need to discuss the paintings. The few questions are more as a start to discussion or maybe to point out something that may be missed easily. My thoughts on the book. The book is exactly what the author claims it to be- a guide. Much of the information provided in the first two sections is mostly known to me but I would not think to bring up or maybe how to verbalize some of it. I enjoyed the break down into age groups. I would not use this as part of our artists discussions but as a guide for me to know the types of things to point out. Overall, I found this book useful and would include it on my school bookshelf as a resource.